Performers include: Jean Stapleton, Carroll O’Connor, Rob Reiner, Sally Struthers, Mike Evans, Isabel Sanford, Jason Wingreen, Allan Melvin, Betty Garrett, Danielle Brisebois, Danny Dayton, Sherman Hemsley, Bob Hastings, Billy Halop, Vincent Gardenia, Mel Stewart, and Liz Torres. This comedy series centers around the Bunker family who live in a tiny home in Queens, NY. Archie (Carroll O’Connor) is the working stiff head of the household and is a crass and rude bigot. His wife, Edith (Jean Stapleton), whom Archie calls “Dingbat,” is extremely kind and attentive but ultimately a bit dizzy. Living with them are their grown daughter Gloria (Sally Struthers) and her husband, liberal Michael Stivic (Rob Reiner) whom Archie has nicknamed “Meathead.” They later lave a son together, Joey. The Stivics eventually move to California and Stephanie Mills (Danielle Brisebois), Edith’s young niece, comes to live with the Bunkers. They embrace and shed a couple tears. Edith tells her husband that he’s “a pip, a real pip.” They lay on the bed holding one another, as the scene closes. First aired: April 8, 1979. 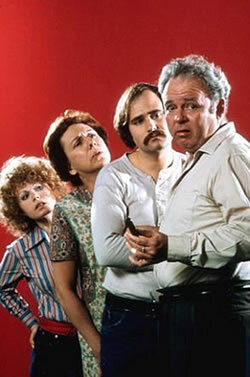 For CBS’ 1979-80 season, the characters moved to a new series called Archie Bunker’s Place. It focuses more on the neighborhood tavern that Archie co-owns rather than the Bunker home. The show lasted four seasons and was a top-rated show, dropping to 23rd place in its final year. The 1979 Thanksgiving episode of Archie Bunker’s Place marks the final time that Archie, Edith, Mike and Gloria would be seen together. Mike has been fired from his job as a college professor in California because of his involvement with a nuclear protest. This puts additional stress on the Stivic’s marriage and foreshadows their eventual divorce. Edith’s health problems in the final episode of All in the Family are a precursor to her death from a stroke on Archie Bunker’s Place. Jean Stapleton appeared in some early season one episodes but decided to leave late in 1979. Edith was mentioned but not seen for the rest of the season. In the season two opener of the spin-off, the audience learns that Edith has died from a stroke. In a 1982 episode of Archie Bunker’s Place, Gloria returns with her son Joey in tow. She’s left Mike, who’s joined a co-ed California commune with one of his students. In a short-lived spin-off called Gloria, she takes a job working at a veterinarian’s office in upstate New York where Gloria and Joey move. The show lasted just 21 episodes. In 1994, All in the Family creator Norman Lear created a new sitcom called 704 Hauser. It takes place in the house formally owned by the Bunkers and revolves around a liberal African-American couple whose son is conservative (sort of a reversal of All in the Family). In the first episode, an adult Joey Stivic (Casey Siemaszko) stops by to visit the former home of his grandparents. • The show inspired seven spin-offs, either directly or indirectly. Direct spin-offs are Maude, The Jeffersons, Archie Bunker’s Place, Gloria, and 704 Hauser (set in the Bunker’s house, many years later). Indirect spin-offs are Good Times (from Maude) and Checking In (from The Jeffersons). • A total of 201 episodes aired during the show’s original network run, with seven being hour-long installments and one being a 90 minute special. In syndication, they are broken up into 210 half-hour episodes. • All in the Family is the first of three sitcoms in history in which all four main actors have won Emmy Awards. The later two shows are The Golden Girls and Will & Grace. • A 90-minute retrospective aired in February 1991. All in the Family 20th Anniversary Special is hosted by Norman Lear and includes clips and interviews with the original four castmembers. Please keep this show on we all have so many good memories with it & many more to make. I have watched All In The Family for years but I missed them shows like Ida did. I bought all the tapes and watch them over and over but don’t have the ones where she died or Joey coming back. That show is still my favorite show. All in the family is the Greatest sitcom ever!